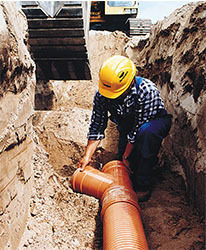 Many years of experience in the supply of underground sewer systems enables JDP to offer civil engineering and utilities contractors a product portfolio which provides a total system solution. Our policy and aim is to supply products of the highest quality from leading manufacturers within the industry, thereby ensuring the best offer for every application. The range includes trenchless technologies, concrete manhole rings and flexible couplings and adaptors. In addition to the systems in this section, products developed and manufactured in our own factories in uPVC such as EN1401-1 sewer drain and fittings, inspection chambers and adoptable sewer can be found in our Commercial, Public and Industrial Buildings Product Specifier.